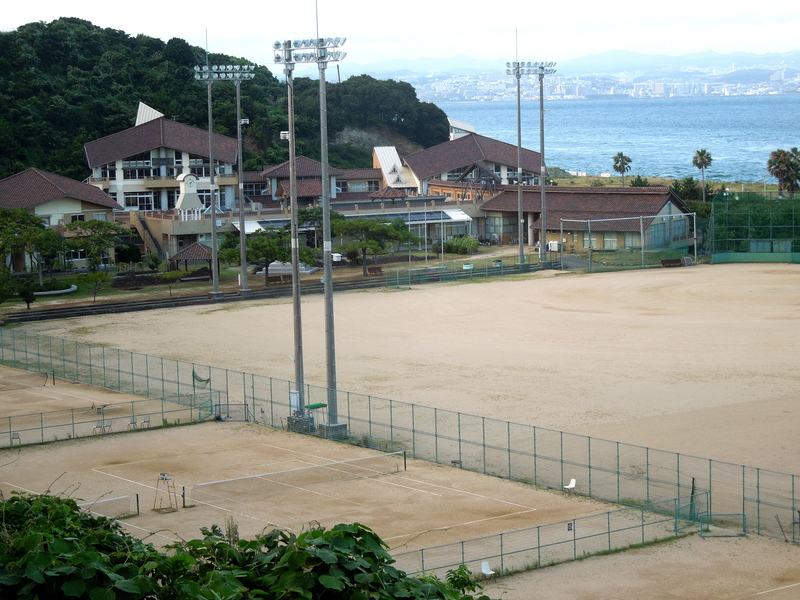 Normally I bike to Hagashiura Middle School. However, there is an island bus, but it takes almost just as long as biking and it cost about $7 round trip. No thanks. The only upside is that its air conditioned on board. This is something that I am beginning to value a lot: air condition. 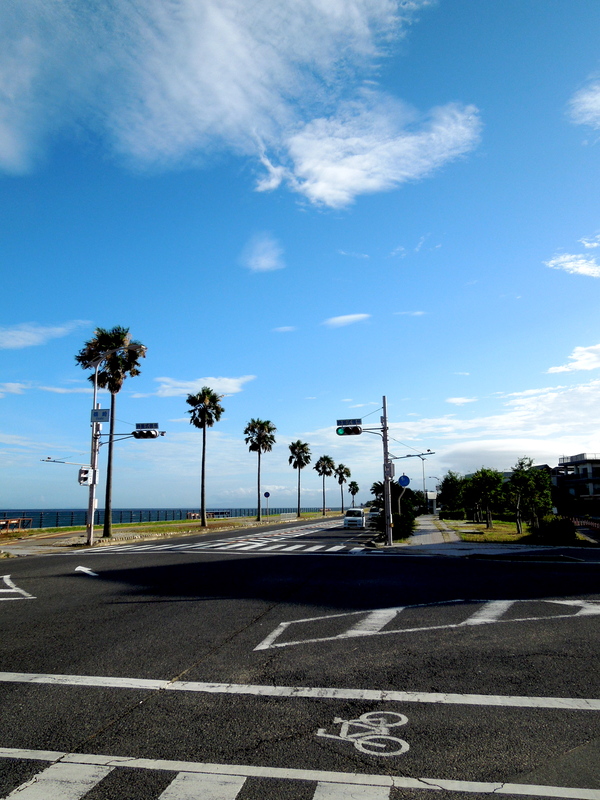 Because of the tropical climate I wear athletic shorts and a tee shirt during the 25-minute ride through the hot and thick humid air of Awaji. I did not know how humid it really was, and on my first day, I arrived drenched in sweat, and was promptly alerted that I had 10 minutes before I would give my self-introduction speech to the entire school. Luckily the self intro was a success, and I didn’t forget any of my lines…all four of them. Good thing I went to a pre departure workshop back in Boston that covered self intros in Japanese! This is Iwaya JHS, one of the two middle schools I teach at. It is only a 3 minute walk from my apartment. You can see Kobe across the water in the background. Upon arrival in the morning, I change into my work clothes, which consist of what my co-workers call “cool biz”; semi casual clothes that are acceptable to wear in the scorching hot summer months. So, I chose to wear kakis and a polo. This, by the way, was still more formal than most of the other teachers who wore some sort of athletic fast drying polo accompanied with clean looking gym shorts. However, the principle and vice principle remained well dressed in black dress pants and a buttoned down shirt. Contrary to what JET told me, I do not need to wear a suit during my first few days. Thank goodness. For lunch I was taken out to okonomiyaki by the assistant basketball coach, who I was told to call “Rock”. Okonomiyaki is like a pancake batter with pork and vegetables in it; it sounds bad, but is actually delicious. Rock is a really friendly guy who is eager to speak English. I’m grateful to be in a school with teachers like him, and its not just because I get to try all the local lunch restaurants. I spent the rest of the day in the office on my computer. But I wasn’t just checking my email or ESPN. I was actually brushing up on Japanese language. Overall, I would say it was a productive day at work. I was also able to witness a little culture lesson. The students show a great deal of respect towards their teachers. This is seen when the students need to meet with a teacher. They hesitantly slide the door to the teacher’s office and say something, then bow to their sensei. Depending on who the teacher is, I can sense some of the kids are nervous when they come into the office. But I would be too if I were 13 and had to enter an office full of Japanese adults. My bike ride home from Higashiura JHS. This entry was posted in Life on Awaji and tagged Awaji, School. Bookmark the permalink. Thanks. There are definitely some scenic areas on Awaji. I hope your first few weeks on JET are going well! Incredible, Stephen! I’m so glad you’re writing this blog. All the detail you put into each post makes me feel like I’m there with you! Miss you! Thanks Brad! I’m still waiting for a visit from you! P.S. Culture shock is a real thing. Get your rest and, if you’re feeling homesick and “what the hell did I do this for” just wait. It will pass and the adventure will begin in earnest. After all, you’re a Jet now!!! Haha. I think of the West Side theme too! Culture shock hasn’t been a big problem yet. Luckily, there are a few other jets near me that I can hang out with and actually speak English with. Thanks for the support! Jealous! What a beautiful location. Thanks! I like the location because it’s isolated and very country, but also an hour from Osaka. Hey Stephen! Awesome blogging 🙂 Happy first official day of school!! !… even though it appears you started already. 😀 Sorry I deactivated fb and don’t have your contact info yet. Also loved your self-intro video! Really wish I had thought of that! Hope all is well! Thanks, Veronica. I hope you had a fun first day in the classroom!